A poll released today found that 75% of Australians either agree or strongly agree that the Federal Government's emissions trading scheme is not tough enough on the big polluters and needs to be strengthened in the Senate. Only 13% disagreed with 12% not knowing. It is certainly encouraging to see that the Australian public has more sense than our Labor/Liberal politicians when it comes to acting on the climate crisis. If only they'd listen more to us rather than their fossil fuel industry benefactors. At the same time as the poll was released, the Australian Greens released research which showed that foreign companies stand to make billions of dollars from the Australian taxpayer if the current scheme becomes law. * 84% of compensation in the coal-fired electricity generators sector will go to foreign companies, based in UK, Hong Kong and Japan. With a total of $3.246 billion flowing to such companies between 2011-2015. 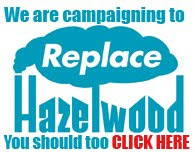 * The owners of the Hazelwood Power station in Victoria, UK International Power Plc, are in line to pocket 28.6% of assistance available to the coal-fired electricity generators sector, or some $1.1 billion. Yallourn W power station, owned by CPL Power Asia, will receive $908 million. *Loy Yang A power station - in line to receive $782million. hhmm, so those very same corporations that should be stopping their burning of fossil fuels, will be paid billions of our money to keep doing it. Does that make sense to anyone? 100% Renewable Energy by 2020!